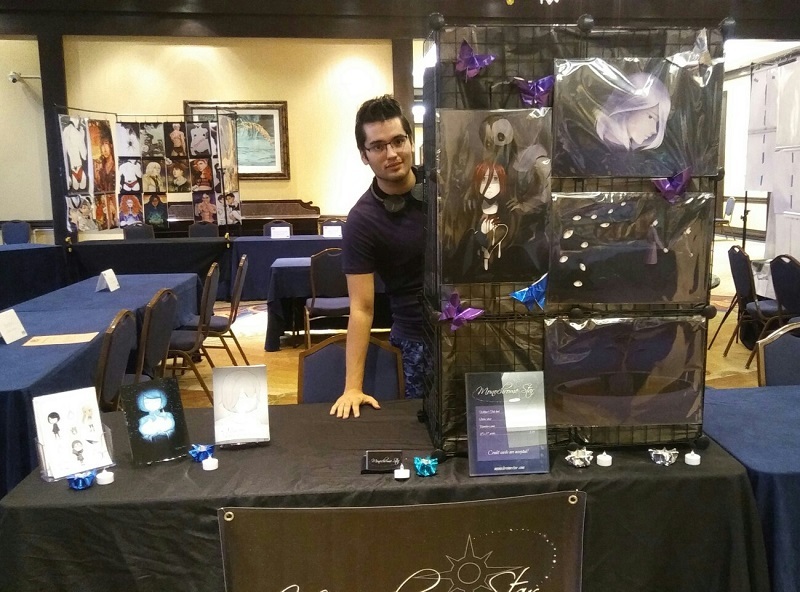 While this wasn’t my first time tabling at a convention, it was my first time tabling alone with my own original works and my first time at this particular con. I ended up rushing my preparation a bit; notice that I’d been accepted didn’t come until a month before the convention started and up to that point, I’d assumed my application was rejected. My plans were actually for everything to be ready by MetroCon in August. Still, I wanted to go, so three months’ worth of planning had to be shoved into one month. There wasn’t enough time for everything I wanted to do, but it worked out well enough despite the rush. I don’t know why it took so long for my acceptance notice to come through, but at the convention itself everything went just fine. I checked in on Thursday, got my badges, and set up. My brother, who played the role of chauffeur and assistant this weekend, was a huge help with the setup. He actually carried my tote (containing both my display materials and inventory) over his shoulder like it was nothing. The display was pretty basic, with a small wall of grid cubes to one side and my books on the other. My overall look was really dark, especially with night-themed prints, and I knew it would be from the start. To liven it up a bit, I’d bought some foil origami paper and decorated the wall with butterflies. I set battery-powered tea lights in eight-pointed star origami candle holders to add a bit of extra flair. My table was quite dark compared to my neighbors and a few people mentioned it (mostly with amusement, though two in particular really liked the mood). Passers-by liked the origami decorations. 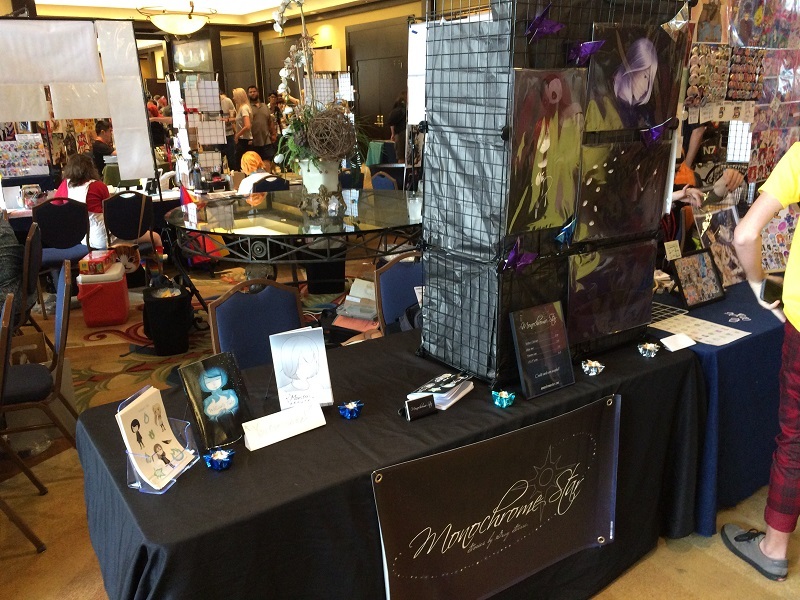 I didn’t have a whole lot of merchandise with me and, since it was my first time and my work was original and unknown, I didn’t expect to sell all that much. However, much to my delight, the people passing by were very open to original content. And, even better, I almost exclusively sold copies of my comics. Only two other items sold: a Keenan print and a Willow sticker sheet. In the end, I sold about half of the books I brought (for both Monsters and Willow’s Tale) and got a lot of really supportive comments from people about my work. One person in particular came back later that day to tell me how much he liked Willow and I’ve honestly never been happier about what I do. Overall, I had a great time this weekend. I’d definitely like to go to AFO again next year. In the meantime, I have a lot of plans for improving my work and displays for MetroCon this August. 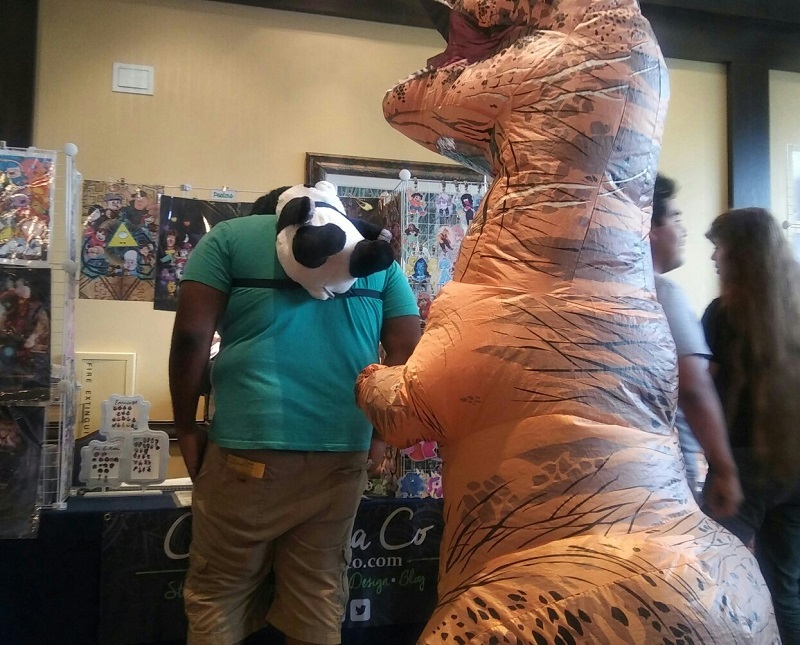 The humble t-rex waits their turn at a nearby table, Saturday evening.